Using Organic methods, we cultivate our mushrooms for mainly chefs based in Cornwall. We also produce mushroom related food products and the grow your own mushroom kits. 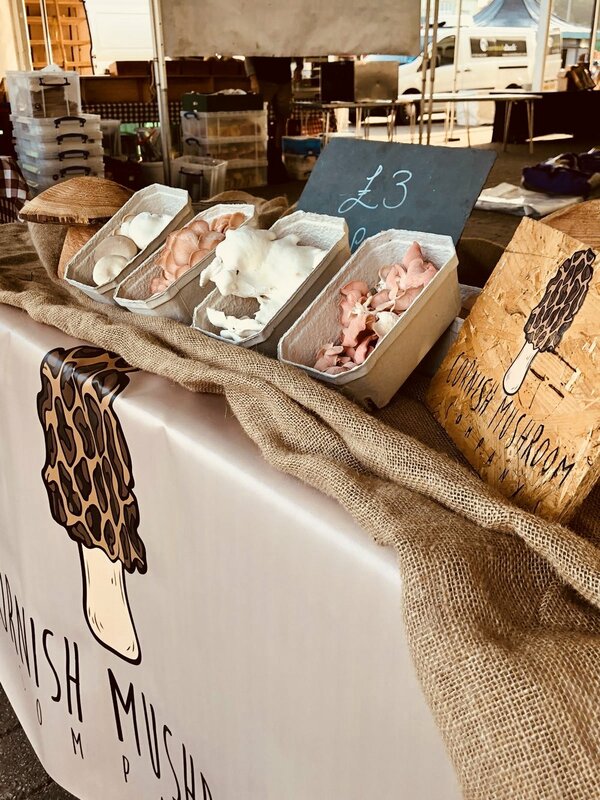 We produce fresh, exotic mushrooms that are locally and economically grown using environmentally sound growing practices so that we can offer exceptional value to our customers and end users. By offering farm tours and engaging with our customers, we look to not only offer mushrooms and mushroom related products, we also strive to educate and share knowledge on environmentally sound cultivation practices. No pesticides, no fungicides and no chemicals in our growing process at all. Using a growing medium of coffee grounds, straw and sawdust means we are up-cycling waste products. Join us Every Saturday at the farmers market located on Lemon Quay in Truro. We are there from around 8am. You are more than welcome to pop into us to pickup some mushrooms. But please send us a message or give us a call, as we may be out doing deliveries or may have harvested all our stock for customers. Contact us with your location and we can let you know the nearest to you.